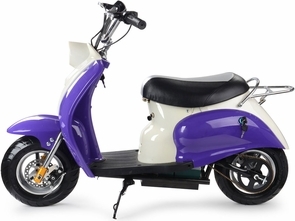 Get sleek styling and amazing performance at an awesome price by buying the children's 24 volt 350 watt electric powered moped scooter ride on. Many years were spent designing a scooter that could run as perfectly as this one does and for such a long duration of time. The unique and eye catching retro Vespa style design is all the rage for kids and will let you ride in true style at speeds up to 15 MPH! The ride time of to 2-5 hours depending on use means that all of your scooter adventures will be long lasting and you'll have ample time to explore new roads that have never been traveled. Great for kids up to 150 pounds that want to ride just two wheels. Recommended for ages 10 and up and the scooter weighs about 60 pounds so it is easy to transport. Want more? The frame is made of super strong steel that will last for years. The 11 inch tires with front and rear disc brakes will go over dirt, grass, street, and more. Comfortable and top of the line padded seat, battery meter, headlight, horn, under seat storage, and working headlights assures that your riding experience will be a smooth one! Riding this battery operated vehicle will assist your child�s coordination. Now kids can have a great time and learn at the same time! Buy this electric scooter and get amazing performance at a price that is simply unbeatable. Amazing 24 volt power in this electric dirt bike for children. Holds up to 150 pounds and comes with 2 battery packs!